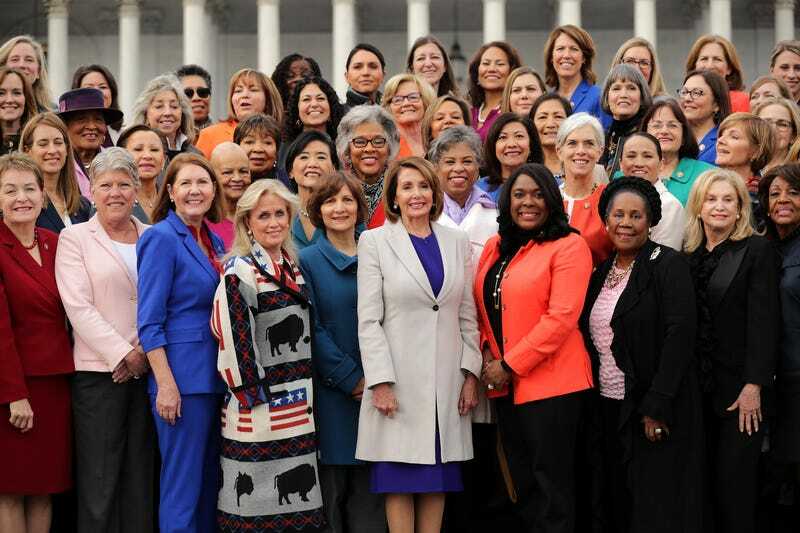 Speaker Nancy Pelosi (D-CA) (C front row) poses for photographs with all of her fellow House Democratic women in front of the U.S. Capitol January 04, 2019 in Washington, DC. The 116th Congress has the biggest number of female members ever while the number of Democratic women in the House has grown from 16 to 89 since 1989. The House of Representatives just took a powerful stance in protection of women—and in direct opposition to the National Rifle Association. On Thursday, the House approved legislation reauthorizing the Violence Against Women Act (VAWA), which expired in February. Now up for renewal, it includes added provisions expanding protections for transgender victims and restricting gun ownership. The bill passed in the House 263 to 158, with 33 Republicans crossing the aisle (and only one Democrat opposing), reports NPR. And in apparent deference to the NRA, the majority of the GOP once again risks appearing to favor the rights of gun owners over the protection of victims of domestic and sexual violence. “Sometimes things are as simple as this: If we are doing a Violence Against Women Act and we are trying to save lives, why would you not close a simple loophole that says if someone has been convicted—convicted, not accused—convicted of domestic violence, that they not have access to a gun?” asked Rep. Debbie Dingell (D-Mi. ), as reported by NPR. And those advocating for the bill aren’t being hyperbolic. Multiple sources of research, including data reported by the National Domestic Hotline, indicate that the presence of a gun during a domestic violence incident is five times as likely to result in a woman’s homicide. Yet, as expected, the NRA opposed the bill, preemptively calling for a “no” vote from the usually compliant Republican party, and reportedly even threatening to keep score and potentially withholding future support from those lawmakers who break from the pack. “The gun control lobby and anti-gun politicians are intentionally politicizing the Violence Against Women Act as a smokescreen to push their gun control agenda,” NRA spokeswoman Jennifer Baker told NPR, though she claims the group supports VAWA minus the gun ownership provisions. However, the few Republicans in support of the new provisions recognize it as a vital bridge between the party and female voters. “I think we need to speak to everyone, including women, and talk about the issues they care about and take reasonable, pragmatic positions, and this is one of them,” said Rep. Brian Fitzpatrick (R-Pa.), the lone GOP co-sponsor of the renewal bill. With Democrats both in control of the House and refusing to accept the bill unaltered (as initially proposed by Republican lawmakers), the GOP now find themselves between a rock and a hard place—or, in this case, between a powerfully transformative law and an equally powerful lobby. But while advocates and the women they are seeking to protect with VAWA may feel this is a win, the bill has yet to reach the Republican-controlled Senate, which will be submitting its own provisions. Additionally, NPR reports the Oval Office “supports a clean [non-provisional] extension of VAWA,” according to White House spokesman Judd Deere. Also at stake in the provisions proposed by the House? Protections that would require shelters and prisons to house transgender inmates in accordance with their gender identity rather than biological assignment. Human rights advocates consider measures like these a crucial component in reducing violence against transgender women—which disproportionately affects transgender women of color (h/t Human Rights Campaign). “Multiple amendments [to the VAWA bill] offered by Republicans on Wednesday, however, sought to eliminate the gender identity and sexual orientation language,” reported the New York Times. Lesko proposed amendments prohibiting shelters from giving access to transgender victims on the basis of putting women and children in situations where they have “grounds to fear for a violation of privacy or for his or her safety,” as well as an allowance for faith-based organizations to deny shelter to transgender people on religious grounds. Both amendments failed. On issues of transgender rights and gun control in relation to domestic violence, Democrats remained firm—especially in maintaining that the NRA has no right to dictate the terms of laws protecting women.